In our previous article we saw Sarayu River, Dasharath Bhavan located in Ayodhya. Now let us continue the journey in foot steps of Lord Sri Rama (Sri Ramanin Padhaiyil). We are celebrating Ramanuja's Uthsavam. We have discussed earlier about Sri Ramayana and its musical connection and how can we use it for the upliftment of Bhakthi is us. Below Table gives us the number of sargams and slokhas available in seven Kandams of Ramayana. Don't get astonished, yes it is 24000 slokhas. In Brahma Loka we have Satha Koti Pravistharam Ramayanam which consists of 100 crores of slokha in it. Lord Brahma can read it in his life time, but it is not possible for us. Hence, Chathurmukha Brahma wanted to introduce it to Bhooloka in simpler form. He searched for a good narrator and He found Narada, a thriloka sanchari (one who roams all 3 worlds) an eligible candidate. It was Naradha who suggested Valmiki who was capable of composing Ramayana. The fame of Ramayana will never vanish. Till the existence of Ramayana, the fame of Valmiki will also exist. Valmiki Ramayana consists of 24000 slokas wherein the 24 Beejaksharas (seed letters) of Gayatri Mantra were installed by sage Valmiki in 24 Slokas. All the 24 slokas containing Beejaksharas of Gayatri Mantra are called Gayatri Ramayanam. As suggested by the title, this is not the story of Rama. It signifies that Ramayana is the essence of the entire Vedas and Sri Rama is Narayana. Listening and chanting of Sri Gayathri Ramayanm bestows peace and bliss. Valmiki Ramayana contains 24000 slokas divided into 7 Kandas, namely, Balakanda, Ayodhya Kanda, Aranya Kanda, Kishkindha kanda, Sundara kanda, Yuddha kanda and Uttara Kanda. The first letter of the first sloka in each group of 1000 slokas is taken from the Gayatri Mahamantra in the same sequence namely - ta, sa, vi, tu, va etc. Which is for every thousand verses, the first verse commences with one letter of the Gayatri mantra. "Tapah svadhyaya nirataam tapasvi vagvidam varam, naradam paripapracha valmikih muni pumgavam" is the first verse. ‘Ta’ is the first letter. Tat savitur varenyam is how the Gayatri commences; and the next one thousand verses starts with the next letter of Gayatri i.e. ‘Sa’ and slokha goes like this "Sa hathwaa Rakshasaan sarvaan, yagnagnaan Raghu nandana, rishibhi poojithasthathra, yadendro vijaye puraa". The twenty-four thousand verses of the Valmiki Ramayana have hidden, within them, at every thousandth verse, a letter of the Gayatri mantra. Many Tamil poets, statesmen, kings and common people have praised Kambar for his Kamba Ramayanam which has more than 10000 songs forming one of the greatest epics of Tamil. Kamba Ramayanam has more than 45000 lines. Valmiki has written Ramayana in 24000 couplets and Kamban in 10,000 verses of 4 lines each. The most important aspects in Kambaramayana are the poetry of Kamban and his art. Kamba Ramayana is not a translation of the Sanskrit epic by Valmiki, but an original retelling of the story of the God Rama. 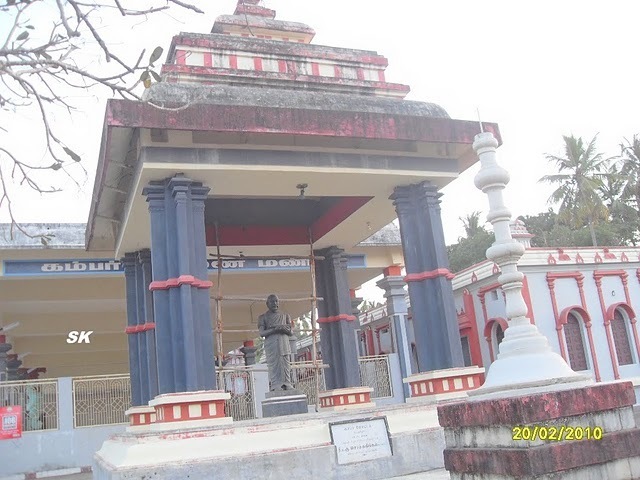 With blessings of Lord Aamaruviappan (Gosakha Perumal), Ther Ezhendur (Therazhundur) located at a distance of about 12 KM from Mayiladuthurai in Nagapattinam district of Tamil Nadu, the great poet Kambar was born. Kambar Mani Mandapam is located in the premises. 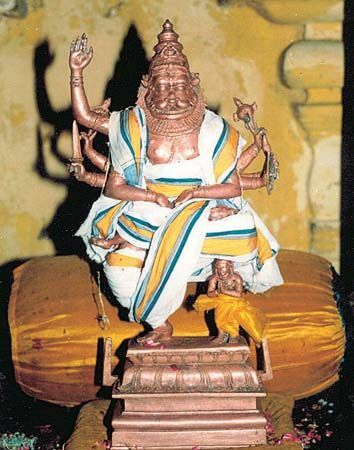 "deva paadaiyin ikkathai saidhavar moovar ahnavar tam ulum mundhiya naaveenan uraiyin padi nan tamil paavinaal idhu unarthiya pambu ahro"
Meaning: Kambar says that the epic Ramayana was composed by three Sages - Valmiki, Vashistha and Bodhayanar. In them I have sung Kamba Ramayanam according to Sage Valmiki who first composed it. We will be including songs from Kamba Ramayanam in coming series of articles. Kamba says that "piththar sonnavum, pedhayar sonnavum, paththar sonnavum pannap perubavo" - I am only a tool, I have sung only with the blessings of Lord. Kamba Ramayana was first delivered in Sri Ranganathaswamy Temple, Srirangam at the court hall near Thaayar sannithi. In this sthalam, Mettu Azhagiya singar (Narasimar) Sannadhi is found and in front of it is found the 4 pillared mandapam (Nallu Kaal Mandapam) known as Kambar Arangetra Mandapam. In this mandapam, Kambar explained for the first time, his great work "Kamba Ramayanam" and in that "Hiranya Vadhai Padalam" was also included i.e. Hiranya vadham is the story about the killing of Hiranya by Lord Narasimha (Vibhishana recounting Narasimha's story to Ravana just before being kicked away). But on hearing the inclusion of it, all the people around the Mandapam protested against it as this is not to be found in Valmiki's Ramayana. Suddenly a thunderous peal of laughter was heard from the sanctum of Mettu Azhagiya singar high up and all gathered in the mandapa at the base, in front of Periya Piratti's sanctum, were thrilled. This was taken as the seal of approval and since then Kamba Ramayana is exalted as the best Tamil work. It is said that Sri Nathamuni was present on that occasion. Kamba Ramayanam was delivered in the month of Panguni on the day of Hasta Nakshatram. The most popular one in northern India is the Ramacharita Manas by Goswami Tulasidas. Goswami Tulsidas lived from 1532 to 1623. Tulsidas was born to Hulsi and Atmaram Shukla Dube in Rajpur, Uttar Pradesh, India in 1532. “Kashi” is considered to be one of the most important pilgrimages and also Ramcharitmanas was written by Goswami Tulsidas in Kashi. He composed it in the form of Chaupai and Doha. A Doha is a couplet consisting of two lines and Chaupai is couplet consisting of four lines. Tulsidas started to compose Rama Charita Manas on day of Shri Ram Navami. Ramcharitmanas literally means the "lake of the deeds of Rama". Our journey on Sri Ramanin Padhayil (footsteps of Lord Rama) is based on all these great epics. Though Sri Ramayana looks huge, nothing to worry, when we go to all the places related to Ramayana we shall understand it better.